Having been involved in Ship Modeling for more than 20 years, I’ve been a big admirer of the Nautical Research Guild and the work of its impressive membership. There have been so many great modelers involved in the Guild, I feel honored to be speaking together in a combined talk with boatbuilder Douglas Brooks at the opening talk of this year’s conference in San Diego. 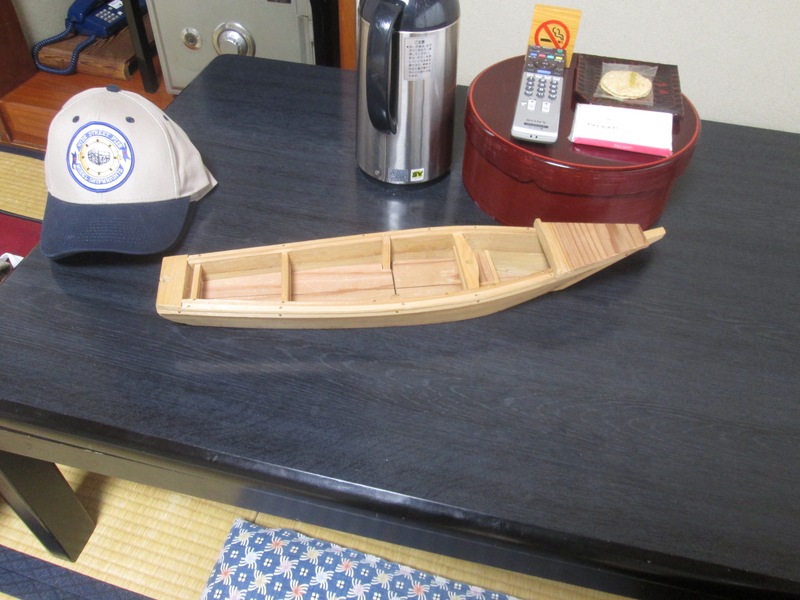 Douglas Brooks will be reprising his talk at last year’s conference on Japanese Wooden Boatbuilding, while I’ll be adding the element of modeling them. 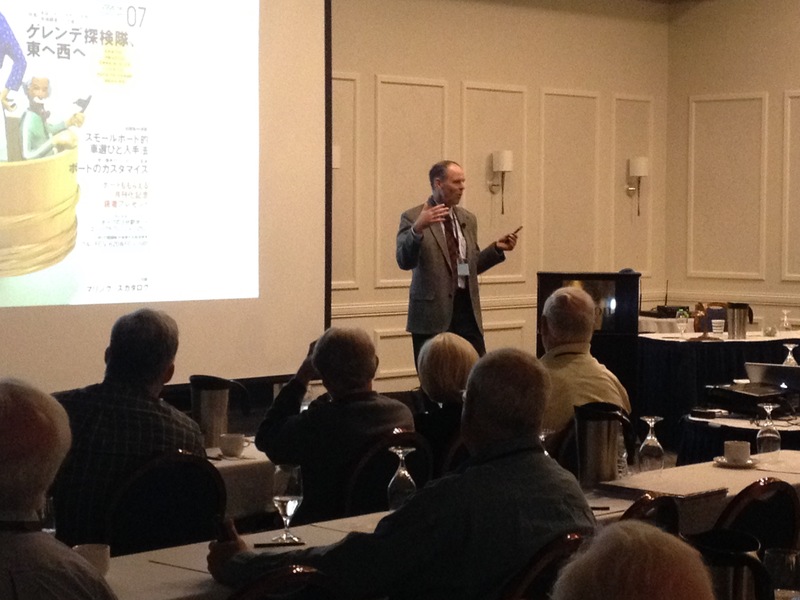 Douglas Brooks speaking at the 2015 NRG Conference in Mystic, CT.
Granted, my portion of the talk will the shorter segment. In the 15 minutes or so that I’ll have, I’ll only be able to scratch the surface of the subject, mostly talking about resources available to those who are interested in building a traditional Japanese boat. Pretty much, just enough to give folks a nudge toward attempting one. The other part of my participation at the conference came as something of a surprise as I was told just last month that I was scheduled to do one of the round table sessions. These are 20-minute sessions that takes place simultaneously with 4 other sessions. People attend the session of their choice, and after 20 minutes, people then switch to another table. So, basically, I have a 20-minute demo, repeated a total of 4 times (with one 20-minute break). Having no idea what I was expected to do, I’d considered a couple possibilities. The first thing that actually came to mind that I thought would work out, was to demo some of the details of paper modeling. Having completed only 1 paper model made it seem a bit odd, but I don’t think anyone else has done it, and I actually did have some interesting techniques to show. But, talking with Kurt Van Dahm, the NRG Chairman, and others, it seemed that the idea was to give me more time to talk about modeling Japanese boats. So, I’ll be talking a mix of building Japanese kits and building from scratch. It seems a bit odd to me, as talking about kits seems a bit like a sales pitch. The only thing preventing it from being a complete conflict of interest, seeing as how I’ve done some work for Ages of Sail, is that Ages of Sail doesn’t currently carry any of the kits I’ll be talking about. And, my most highly recommended kit, the Tosa Wasen, will only be available direct from the manufacturer. Bekabune model given to me by the curator of the Urayasu Museum. In any case, I’ll bring my in-progress Urayasu Bekabune models and a small supply of Japanese woods for people to sample themselves, giving them a chance to sand, cut and bend them. Show a couple in-progress kits, talk about how to read the Japanese language plans, etc. A 20-minute discussion should go by pretty quick, then repeat it three more times. I really hope it won’t end up being the lamest NRG round table discussion in history, and people will find it interesting and useful. Wish me luck! This entry was posted in Clubs and Organizations, General Blog, Wasen Modeling News and tagged Japanese Boat Models, NRG Conference, Ship Model Talk, Wasen by catopower. Bookmark the permalink.